Eating fruits and vegetables that are all colors of the rainbow for better health is a great idea, but eating the color purple can deliver “super” health and wellness benefits. 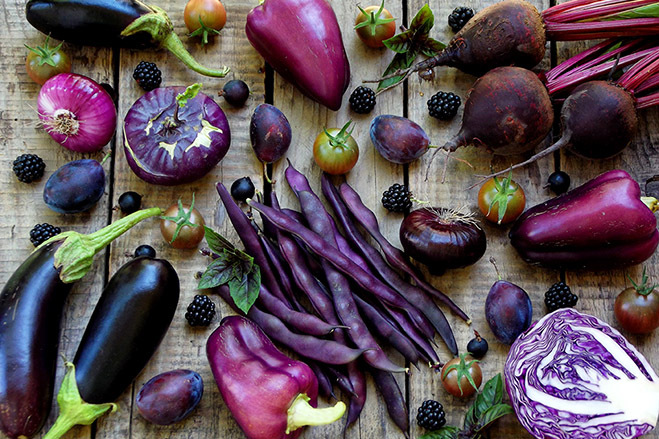 Here’s a few reasons why purple fruits and vegetables are nutritional powerhouses. According to a study by Tufts University, dark berries like aroniaberries and blueberries may help to reduce your risk of cataracts, glaucoma, and macular degeneration. Aroniaberries contain a large amount of carotene, which protects cells from damage and the eyes from cataract formation. They are also rich in flavonoid antioxidants such as luteins and zeaxanthins. Zeaxanthin has photo-filtering effects on UV rays and thus protects eyes from age-related macular disease and eye inflammation (uveitis). Researchers in Japan have also been researching the effects of aronia extract (ACE) on eye inflammation. The study was published in Investigative Ophthalmology and Visual Science several years ago. Did you know berries are good for easing inflammation? Berries top the charts in antioxidant power, protecting your body against inflammation and free radicals, molecules that can damage cells and organs. James Joseph, PhD, director of the Neuroscience Lab at the United States Department of Agriculture Human Nutrition Research Center on Aging at Tufts University, Boston notes that people become more susceptible to the damaging effects of free radicals and inflammation as they age. Berries help prevent those effects by turning off the inflammation triggers. Purple foods also contain the nutrient flavonoids which provide protection from DNA and cell damage. Plus these foods help boost the production of cytokines (substances that have an impact on certain cells of the immune system) that regulate the immune responses. They have also been shown to help control enzyme production that aids nutrient absorption, and strengthen cell membranes by making them less permeable and fragile. The antioxidants found in purple foods can help prevent neurodegenerative diseases that occur as we grow older. Studies have shown that diets high in antioxidant like those present in dark berries can lead to a reversal in certain age-related issues that impact the brain. Anthocyanins have been found to help improve neuronal signaling in the brain. The purple Aroniaberries in Superberries products are a superfruit nutrient powerhouse. 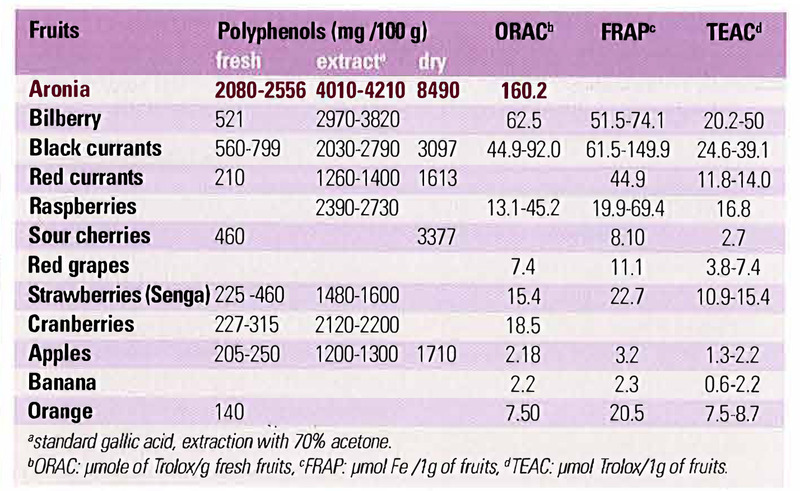 Superberries Aroniaberries top the polyphenol charts. A polyphenol is a plant nutrient that acts as an antioxidant and can provide important benefits for overall health. Anthocyanins are the phytonutrient that gives purple fruits and vegetables their color. Anthocyanins play a role in fighting free radicals (abnormal cells) which can lead to age-related diseases. Anthocyanins also have many other effects when it comes to protecting cells, tissues and vital organs. Research has shown that anthocyanins impact gut health when they interact with microflora in the gut. This can help decrease inflammation associated with many chronic diseases.